Nürburgring lap times, for carmakers, are like football games in college. Almost everyone participates, despite onlookers’ attention ranging from “don’t care at all” to “this is the most important thing ever” until someone wins—then, it’s a big deal. But Hyundai isn’t into ‘Ring records, for a strangely good reason. Since every car from the meanest Porsche 911 on the market to a giant Audi SUV tests on the Nürburgring, automakers can take it at their own pace. 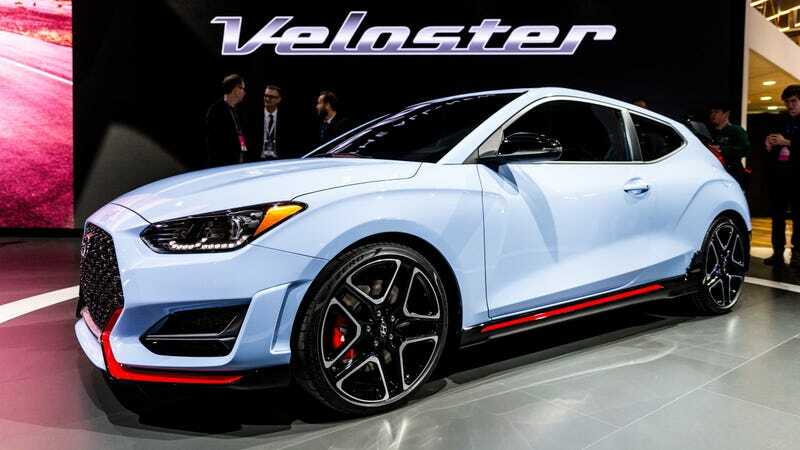 Hyundai’s N performance line, which showed off the 275-horsepower 2019 Veloster N at the Detroit Auto Show this week, is doing just that, with its boss telling Road & Track the Veloster N is “not the fastest car on the track” because that’s not the idea. While a lot of other performance automakers fight back and forth for lap records on Germany’s ‘Ring, the philosophy from Hyundai N boss Albert Biermann on that is pretty much “nah.” He wants the car to be enjoyable on track and on the road, he told Road & Track, but the choices Hyundai made for the car were never handpicked for track performance. “We developed it for driving fun, for nice challenging mountain roads or a tiny challenging race track. We don’t care about lap times. If you’re going for lap times, the aero settings are different, the suspension setting is different. It’s faster for a professional driver, but it’s not as enjoyable. We don’t care for that. We want many people to enjoy this N experience, people who might not have driven a sporty car before. On the surface, the idea that Hyundai’s performance division doesn’t want to go for Nürburgring lap records seems like an easy reason to yell “Weak!” and move onto the next hot hatch—one that’s really hot, on the ‘Ring. But Biermann has a good point: Track monsters are fun, but they’re track monsters. Hyundai wants this car to be fun off of the track, and perhaps appeal to a wider audience that doesn’t want some track-eating hot hatch that destroys all of the ‘Ring records. It’s a happy medium, if we take Biermann’s word for why he doesn’t want to be the best on the ‘Ring. Hyundai still tests its cars there and figures out how they handle on a track, but doesn’t spend months trying to beat another company’s record for the bragging rights of it. It’s an interesting choice, but it’s refreshing. Manufacturers could stand to participate in fewer expensive, time-consuming spitting contests, after all. Bragging rights are best suited, and least annoying, for people who don’t like to brag.